Magnificent day of cycling in the morning of this Sunday with the celebration, in Pinto (Madrid), of the second edition of the Race Schools of the Fundación Alberto Contador. A second edition with a great power of call for both the training tests as well as popular races with non-federated participants promoted in the prolegomena to bring the competition by bicycle. As a whole, the 300 participants have been comfortably surpassed between both sides, federated and not federated, with 231 riders divided between the categories alevín, infantile, promotion and beginner and more than a hundred in the three popular races held according to the distribution by ages. In the circuit of the avenue of Juan Pablo II, in the heart of the district of Tenería of the population of Madrid, have come together riders from many parts of the Spanish geography. Cyclists from Galicia, Asturias, Castilla-La Mancha, Castilla y León, Comunidad Valenciana, Murcia and Andalucía, as well as different schools from the Community of Madrid. But there has also been an international presence. Up to thirteen Italian runners have taken part in the different events with the full representation of the Unione Ciclistica Costamasnaga. 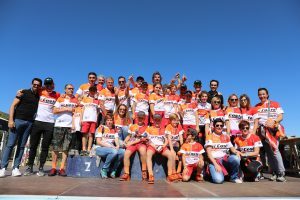 The Coslada Cycling Union has been the great dominator of this last event in the schools calendar of the Madrid Federation. Among other results, Filippo Colella (U. C. Costamasnaga) and Carla Pablos (U. C. Coslada) were the winners in Principantes; in Alevín, the first place corresponded to Rubén Sánchez (U. C. Coslada) and Irene Moreno (U. C. Coslada); in the Infantil category Jorge García (U. C. Fuenlabrada) and Celia Ramírez (U. C. Fuenlabrada) won. “It has been a really good experience. They are different races for us because of the way we run, the developments used,… But for the kids it has been something wonderful. It pays us absolutely to do 1,600 kilometers to be here. It’s our icing on the cake, a prize for the kids. We have just won the Italian championship for schools for the third year running. We are very grateful to the Foundation for all its facilities and help,” explains Antonio Usuelli, director of the Unione Ciclistica Costamasnaga. “It’s very exciting to see so many children from all over Spain, and also from abroad, on a day like this. Many come from far away and I remember when I started. Many families have made an important economic effort, because there is accommodation, travel… Yes, I want to tell all those parents that every kilometre, every effort they make, is an investment in the education of their children. 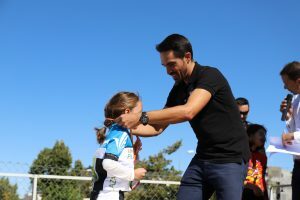 I don’t think there is any other sport like cycling to educate your children in the values of companionship, teamwork, discipline, sacrifice… As a father, a recent father, I would sign that my son would be raised until he was eighteen years old in this wonderful world,” explained Alberto Contador during the award ceremony. “But I do want to tell the kids that the important thing is to enjoy, no matter what you do,” Contador continues. “I started late, relatively late, in cadets. I didn’t win anything. Also, I would take off the hook if two wrong curves came… And then in the long run it was something better. Right now it’s all about having fun, having fun. You can go out on a bike if you like. And if not, no. The time will come for a major discipline, if it has to come. And you have to apply yourself to studies. All children who want to join the Foundation’s teams need to know that in the campus selection process the academic curriculum is just as important as the sports curriculum”. 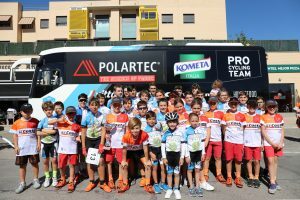 This second edition of the Fundación Alberto Contador School Race would have been impossible without the collaboration of the Pinto Town Hall, the Plaza Éboli Shopping Centre, the restaurants La Mafia se sienta a la mesa, the E.Leclerc supermarkets, the Hotel Princesa de Éboli, the restaurant La Capilla and Rotor Bike Components.